Because you made me cookies! That’s why I talk to you. You did make me cookies, right? No? Oh. Well, you might want to get going on that. 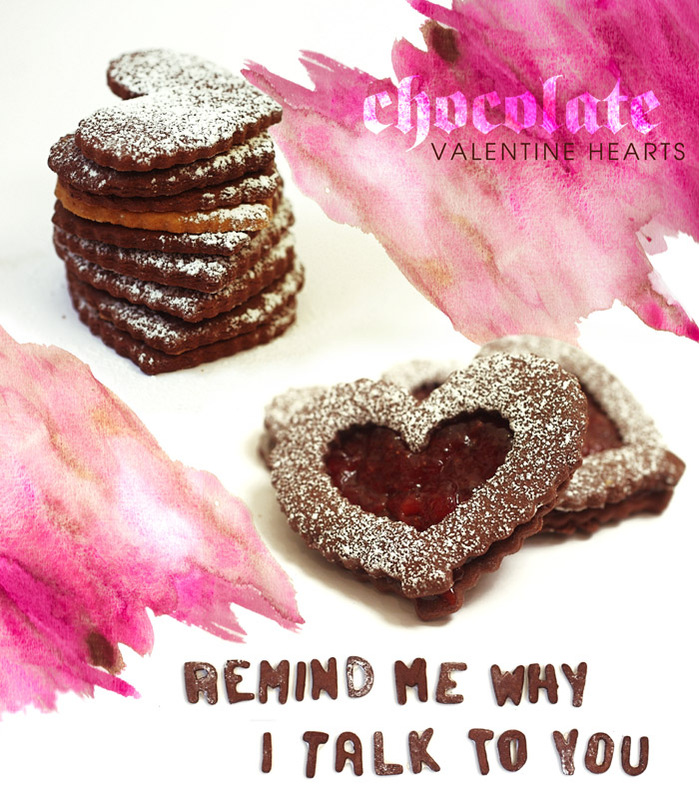 These are one of my favorite types of cookie (right along with the pizzelle and the Russian Tea Cakes), but I only make them once a year for Valentine’s Day. In a large bowl, beat the sugar and 1 cup (2 sticks) butter until light and fluffy. The color will turn pale yellow. Add the milk, vanilla and egg and blend well. I used my food processor for this, and it worked quite nicely, but you can also use a hand-held mixer. Lightly spoon the flour into a measuring cup and level it off at the top. Gradually mix in your measured flour, cocoa powder, baking soda and powder. Mix until combined. Chill the dough for at least 1 hour in the refrigerator. Heat the oven to 350 degrees. On a floured surface, roll out the chilled dough to 1/8 inch thickness. 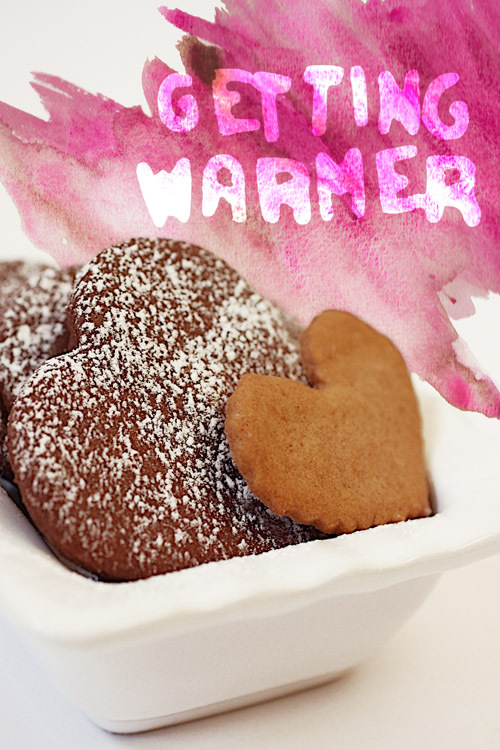 Cut with heart shaped (or any-shaped) cookie cutters and place on an ungreased cookie sheet. Bake for 9-11 minutes, remove and let cool. If you can find them, use nesting cookie cutters, so that you can cut out a smaller heart from the inside of one of the larger hearts. This allows you to see the jam inside. Bake the cookies as instructed above. 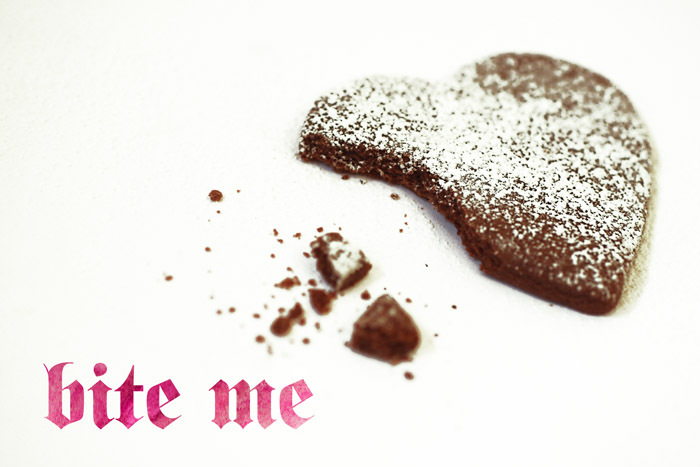 Once your cookies have cooled, spread some jam on one side of a heart cookie, and top with the cut-out version. Line them all up and sprinkle on some Confectioner’s sugar to make them fancy! A pint of your favorite ice cream (I used Talenti Black Cherry Gelato. A note on this: the consistency of Talenti is on the soft side. It makes for melty sandwiches. Which isn’t a bad thing, I’m just warning you). Bake the cookies as instructed. 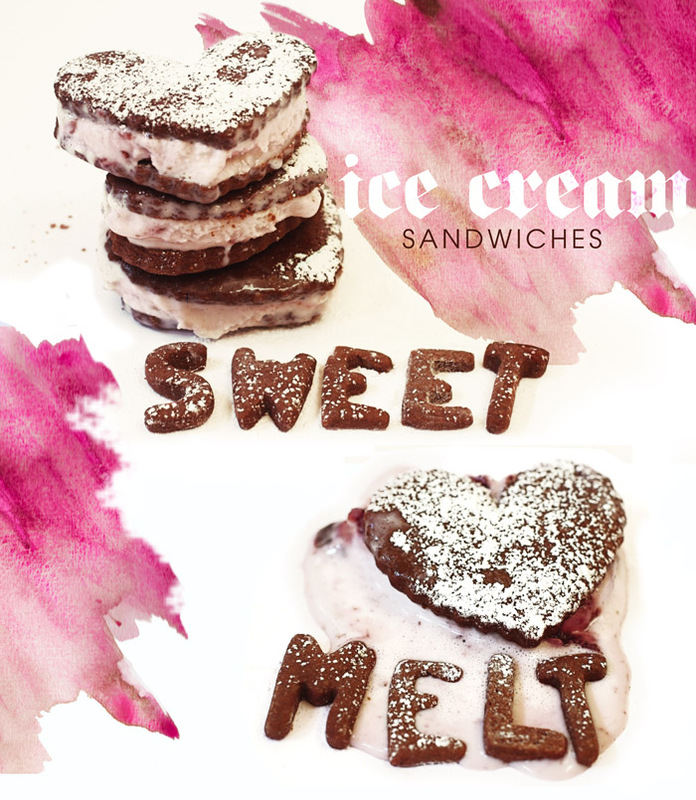 Once they have cooled, spread some ice cream on one cookie, then top with another to make a sandwich. You can even pop them in the freezer after they are assembled so they can keep for a while. This has the added bonus of re-freezing the ice cream so it’s not running all over the place. You can also get alphabet cookie cutters and spell out messages, like I did in the first photo. I now have an entire cookie alphabet that hangs out in my fridge. Designers like this kind of hands-on typography. It gives us a thrill.